Sometimes we speak before we think. Sometimes we buat perangai ‘best’. And sometimes, we upset those we sayang the most. But unlike a certain boy band that once sang “it’s too late, to apologise, it’s too laaaate”, we believe it’s never too late. Janji your heart’s in the right place lah. This Raya, it’s time for you to make things right. Meet up with each other, make amends, and #CakapSorryYe. If you need a little help breaking the ice, well, we can help. Send them a ‘Sorry’ Raya card which we will personalise with your name and the recipient’s name. Yes, a physical card they can touch and feel, so they know how much you mean it. There are four types of cards you can choose from, and each one can be redeemed for only 699 GrabRewards points. Meet up with them and say sorry in person (hint hint: you can always Grab your way there). 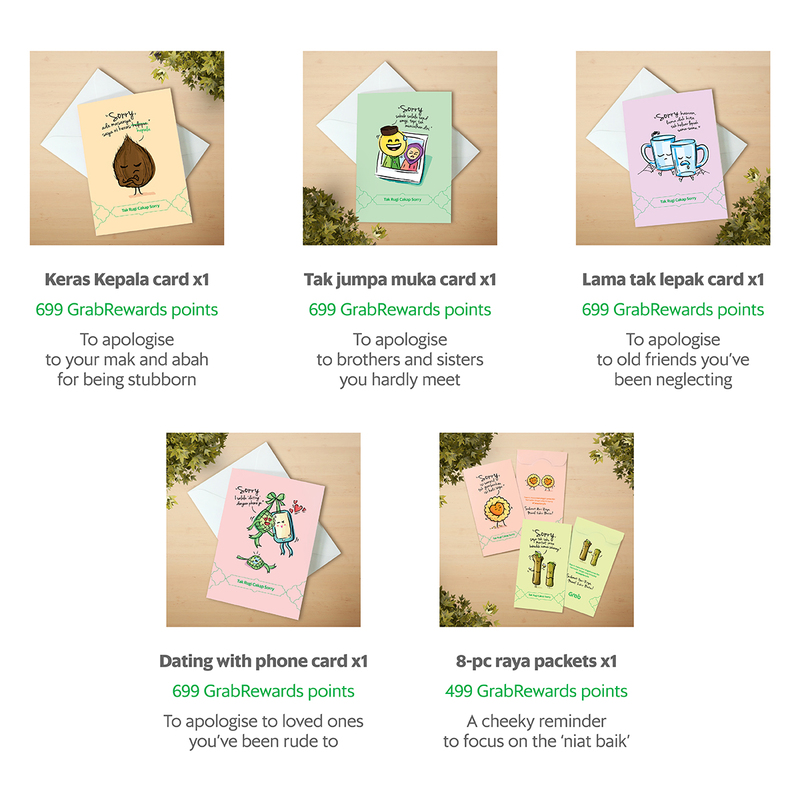 As for those who are giving out duit raya, you can also redeem special Raya Packets from GrabRewards for only 499 GrabRewards points. Each 8-piece set comes in two designs. Lastly, to all our Grab passengers and driver-partners, we’d also like to say sorry for all the times our service has been less than smooth. We promise we’ll keep improving. Limited to two (2) rewards per customer. Accurate information of the customer’s address and mailing information must be provided in the ‘Redeem card now’ in the Rewards Catalogue after redemption. Reward will be voided if the customer fails to provide complete information as requested by 12 June 2018, 11.59pm. The item will be delivered to you within 10 business days via registered mail once the pax have filled in the form with accurate mailing details and the unique code provided on the redemption screen. Redemptions are non-returnable and non-refundable. Points used for redemption cannot be refunded. The delivery attempts will only be done at a maximum of 2 tries. Limited to 4 (four) rewards per customer. Please be reminded that profanity will not be tolerated and will automatically disqualify the purchase. No refunds will be provided for such cases. The Campaign will run on 30 May 2018 – 18 June 2018. The Organiser reserves the sole and absolute right to alter or end the Campaign at any time prior to the expiry of the Campaign Period without giving any prior notice and no compensation in cash or in kind shall be given.